We're continuing our Christmas gift guide ideas following our Top 10 All Time Kids Books post, posted this week. We love our picture books and even though these are easy to grab from the local library, there's something about owning your little picture book that makes reading it extra special. Throughout the years, we have come to have a nice little collection that we love to read out so we thought we'd put a list together of some favourites, some new and some old picture books that we think are always worth a read! Below are affiliate links for your convenience. Little ones will love lifting the flaps to discover the animals the zoo has sent - a monkey, a lion, and even an elephant! But will they ever find the perfect pet? This firm bestseller will be your little one's favourite. This simple lift-the-flap book has been a hit since it was first published in 1982 (I feel old ha!). We love this bright, simple yet fun book with bold drawings and catchy text! Little Mister goes 'wow' every time he turns the pages and finds a new animal! To BUY Dear Zoo from Book Depository, head to this link. This colourful board book is for machine-mad little ones - from diggers and tractors, to cranes, bulldozers and more! With bold illustrations and fun, rhyming text, this sturdy board book is perfect for busy pre-schoolers. Children will love spotting all the details on each page and joining in with all the different sounds. Both my son and daughter love this fun and colourful book and love making the sounds 'beep beep'. To BUY Dig Dig Digging from Book Depository or other books in the Awesome Engines range, head to this link. This cute lift-the-flap book series is all about negotiating everyday problems with busy toddlers! In this board Tilly the Tiger is always on the go and needs a few reminders before heading to bed. It's fun to find out what Tilly is getting up to behind the flaps inside of going to bed. We found this cute and sturdy book at the library years ago and we loved it so much we bought the other books in the collection! Slow Down, Sidney!, Don't Do That, Dexter! and Be Quiet, Bertha! To BUY David Sim books from Book Depository, head to this link. This bestseller lift-the-flap book for little ones is filled with facts about dinosaurs. 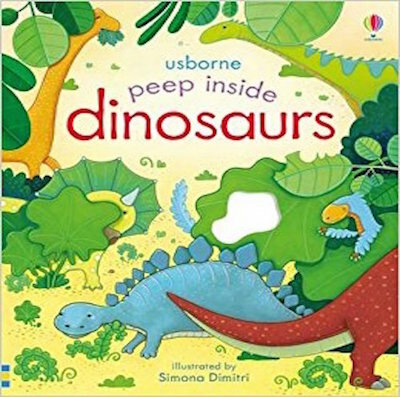 Little children can lift the flaps and peep inside to find out where dinosaurs lived, what they ate and what happened to them. So cute and full of facts! I just realised there's Peep inside books for different places - I will need a loan for Santa at this rate ha! Peep inside the Zoo, Peep inside Night-time , Peep inside Animal Homes, Peep inside the Garden, the list goes on! Wow! To BUY Peep inside Dinosaurs from Book Depository, head to this link. You can't go wrong with this bestseller and even though we've read it a thousand times, we are still looking for the green sheep today! To checkout this book or any of Mem Fox's books from Book Depository, head to this link. This cute bestselling and award-winning book is perfect for little ones. 'One, two Rudie Nudie, Rudie Nudie in the bath, ..' This cute and fun book captures the joy and energy of children with funny rhymes and simple illustrations. We love reading this book at bed time especially after a nice warm bath! To BUY this book from Book Depository or other Emma Quay books, head to this link. Santa only comes once a year but the 'That's Not My..' books are enjoyed all year round! The best selling and award winning touchy feely and nicely illustrated series will have little ones touch a variety of textures which makes these books baby and pre-school favourite classics. To BUY this book or other 'That's Not My ..' books from Book Depository, head to this link. This bold and bright book for babies contains beautifully designed high-contrast images that are easy for babies to focus on and touchy-feely patches to bring the pictures to life. Each picture contains a tactile element to help very young children develop important sensory skills. The padded 'soft touch' hardback format is perfect for sharing or can be propped up for babies to see by themselves. My little ones are obsessed with touchy-feely books and this book always comes along with us in the car, pram or in bed - very cute! I see there's more in the range, how cute! To BUY this book or other Baby's Very First' books from Book Depository, head to this link. Would you like to meet Noni? She's the friendliest pony. She lives on a farm overlooking the sea and loves to play with her best friends Dave Dog and Coco the Cat. This cute Australian favourite follows on from Alison Lester's other books, Noni the Pony goes to the Beach, Magic Beach, Imagine, My Farm and Are we there yet? and more! To BUY this book from Book Depository or checkout other Alison Lester books, head to this link. Touch a rabbit, smell flowers, look in a mirror, and participate in other activities! Makes the cutest nursery present! To BUY Pat the Bunny from Book Depository, head to this link.